Oh, oh, the sun's out at the moment. I must go pull weeds now. I'll return. Yes, Harold, I do have more to say! Craig caught a green slimy frog hiding in the raspberries today. Think he'll get warts? Yesterday, I recalled 1993. 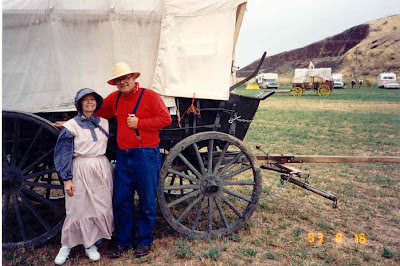 In August, Craig and I had joined the official sesquicentennial wagon train at Pendleton, Oregon and headed west for two days. 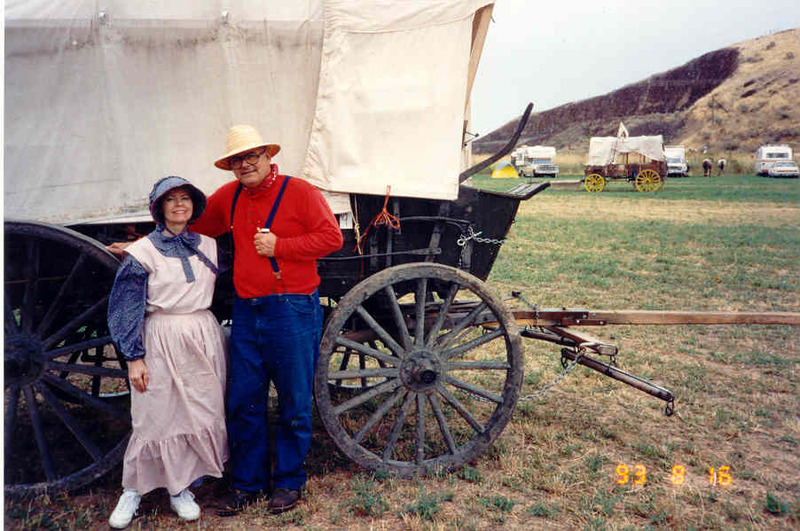 We rode in a BLM wagon with no springs, making a very rough ride over pasture land and highways. Imagine driving with metal wheels over rocks. Oh, where was my Cadillac? We had joined ten other covered wagons, forty cowboys, and fifty walkers for this once-in-a-lifetime experience. We had a few comforts of home: two buses for those who tired of walking, a shower truck, two outhouse trucks and several catering trucks. Three accidents happened on our first day. A cowboy rode next to our wagon for conversation. Rain made the freeway slippery which caused his horse to fall down on two legs. The animal came close to falling under our wagon wheel while leaning hard against our wagon. One close call! Another horse bucked off his rider; cowboy received a slight injury. The third accident developed when a runaway wagon, due to a broken rein, caused the horses to run in a circle. A child on board screamed. Cowboys came to the rescue and controlled the horses in a matter of minutes. Screaming does get everyone's attention on a wagon train. Our second day started cold, rainy, and windy. The sides of our covered wagon were down all day, obstructing most of our view. We rode sixteen miles from Echo to Butter Creek Junction. Our weather cleared in the afternoon in time for dinner and an after-dinner show. The singers told jokes and sang silly western songs. The third morning, the wagon train continued west. We took home movies of the train winding up the road without us. I almost wished we were going with them, but two days on the trail created the impression on a week-long trip. No favorite foods, no electricity for my curling iron, and wet sleeping bags. We headed east in our truck to visit the Interpretive Center at Baker City which depicts the real hardships and sacrifices the pioneers made to come out West. I'm glad they came, but also glad I wasn't with them. Thanks for visiting today. Create a great week! Comments: folks7777@gmail.com or click pencil below.